Alkaline hydrothermal vents may have played a role in the origin of life. Chimney-like mineral structures on the seafloor could have helped create the RNA molecules that gave rise to life on Earth and hold promise to the emergence of life on distant planets. Scientists think Earth was born roughly 4.54 billion years ago. Life on Earth may be nearly that old with recent findings suggesting that life might have emerged only about 440 million years after the planet formed. However, it remains a mystery how life might have first arisen. The main building blocks of life now are DNA, which can store genetic data, and proteins, which include enzymes that can direct chemical reactions. However, DNA requires proteins in order to form, and proteins need DNA to form, raising the chicken-and-egg question of how protein and DNA could have formed without each other. To resolve this conundrum, scientists have suggested that life may have first primarily depended on compounds known as RNA. These molecules can store genetic data like DNA, serve as enzymes like proteins, and help create both DNA and proteins. Later DNA and proteins replaced this “RNA world” because they are more efficient at their respective functions, although RNA still exists and serves vital roles in biology. However, it remains uncertain how RNA might have arisen from simpler precursors in the primordial soup that existed on Earth before life originated. Like DNA, RNA is complex and made of helix-shaped chains of smaller molecules known as nucleotides. One way that RNA might have first formed is with the help of minerals, such as metal hydrides. These minerals can serve as catalysts, helping create small organic compounds from inorganic building blocks. Such minerals are found at alkaline hydrothermal vents on the seafloor. 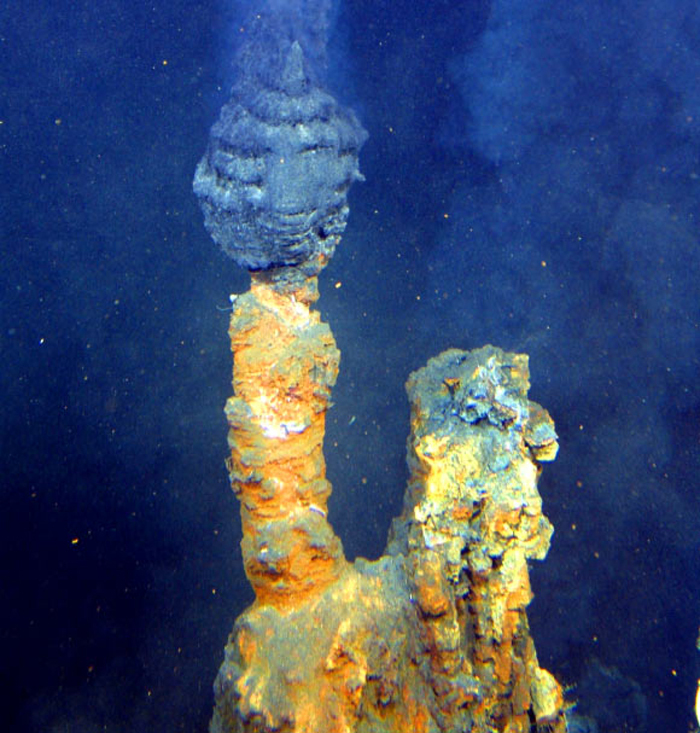 Alkaline hydrothermal vents are also home to large chimney-like structures rich in iron and sulfur. Prior studies suggested that ancient counterparts of these chimneys might have isolated and concentrated organic molecules together, spurring the origin of life on Earth. To see how well these chimneys support the formation of strings of RNA, researchers synthesized chimneys by slowly injecting solutions containing iron, sulfur and silicon into glass jars. Depending on the concentrations of the different chemicals used to grow these structures, the chimneys were either mounds with single hollow centers or, more often, spires and “chemical gardens” with multiple hollow tubes. 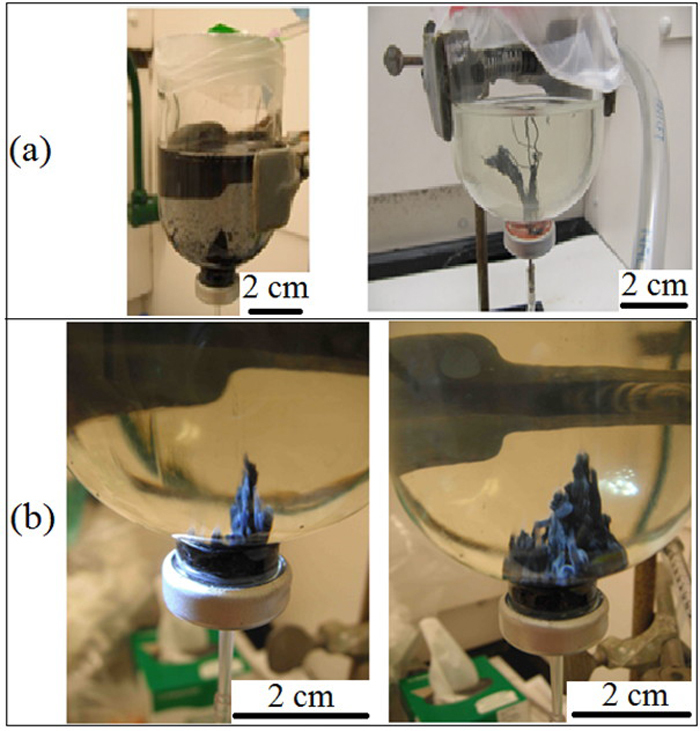 Chimney-like mineral structures created in the lab created from solutions containing iron, sulfur and silicon under a) low concentrations and b) high concentrations. Structures in a) represent mound (left) and spindle (right) formations, while those in b) represent chemical garden formations. Credit: Bradley Burcar et al., Astrobiology. “Being able to perform our experiments in chimney structures that looked like something one might encounter in the darker regions of Tolkien’s Middle Earth gave these studies a geologic context that sparked the imagination,” said study co-author Linda McGown, an analytical chemist and astrobiologist at Rensselaer Polytechnic Institute in Troy, N.Y. The chimneys were grown in liquids and gases resembling the oceans and atmosphere of early Earth. The liquids were acidic and enriched with iron, while the gases were rich in nitrogen and had no oxygen. The scientists then poked syringes up the chimneys to pump alkaline solutions containing a variety of chemicals into the model oceans. This simulated ancient vent fluid seeping into primordial seas. Sometimes the researchers added montmorillonite clay to their glass jars. Clays are produced by interactions between water and rock, and would likely have been common on the early Earth, McGown said. The kind of nucleotides making up RNA are known as ribonucleotides, since they are made with the sugar ribose. The scientists found that unmodified ribonuclotides could form strings of two nucleotides. In addition, ribonucleotides “activated” with a compound known as imidazole — a molecule created during chemical reactions that synthesize nucleotides — could form RNA strings or polymers up to four ribonucleotides long. The scientists found that not only was the chemical composition of the chimneys important when it came to forming RNA, but the physical structure of the chimneys was key too. When the researchers mixed iron, sulfur and silicon solutions into their simulated oceans, instead of slowly injecting them into the seawater to form chimneys, the resulting blend could not trigger RNA formation. “The chimneys, and not just their constituents, are responsible for the polymerization,” McGown said. These experiments for the first time demonstrate that RNAs can form in alkaline hydrothermal chimneys, albeit synthetic ones. “Keep in mind, however, that hydrothermal vents are dynamic systems with gradients of chemical and physical conditions, including temperature,” McGown said. In principle, cooler sections of hydrothermal vents might have nurtured RNA and its precursor molecules, she said. In the future, McGown and her colleagues will perform experiments investigating what effects variables such as pressure, temperature and mineralogy might have on the formation of RNA molecules, focusing primarily on conditions mimicking deep-ocean environments on an early Earth and those that may also have existed on Mars and elsewhere, McGown said. The scientists detailed their findings in the July 22 issue of the journal Astrobiology. 1 New York Center for Astrobiology, Rensselaer Polytechnic Institute, Troy, New York. 2 Department of Chemistry and Chemical Biology, Rensselaer Polytechnic Institute, Troy, New York. 3 NASA Jet Propulsion Laboratory, California Institute of Technology, Pasadena, California. 4 NASA Astrobiology Institute, Icy Worlds. 5 Department of Earth and Environmental Sciences, Rensselaer Polytechnic Institute School of Science, Troy, New York.